England's Jodie Williams and Bianca Williams produce personal bests performances to take silver and bronze as Nigeria's Blessing Okagbare storms to victory in the women's 200m final. 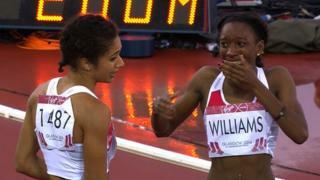 Okagbare finished in 22.25secs to add to her 100m victory, ahead of Jodie Williams (22.50) and Bianca Williams (22.58). England's Anyika Onuora, who finished in fourth in 22.64, also ran a personal-best.